This small selection of paintings and two pastels with French colonial provenance is mostly limited to portraits in Canadian collections. With a few exceptions, the majority were completed in France. 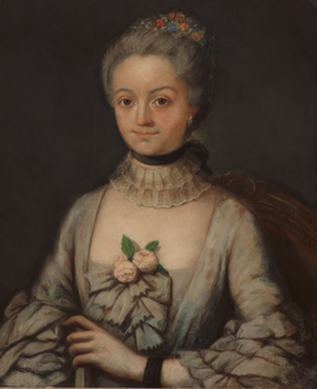 Portraits of family members were an important part of elite representation. Images of the king, queen, and other members of the royal family are recorded in colonial probate inventories. Elite households in New France also contained devotional paintings. Depictions of Christ, the Virgin, saints and other religious scenes were especially popular and often given as gifts to churches and religious houses as marks of piety. Generally framed and hung on walls, some paintings were designed to be placed over doorways and known as dessus de porte. Such an overdoor painting was appraised in the home of François Bissot and Marie Dumont in Québec in 1745. In 1680, immigrant Denis-Joseph Ruette d'Auteuil, ennobled by Louis XIII in 1643, owned "two pious paintings depicting the holy Virgin and infant Jesus" in Québec. His son François owned seven paintings upon his death in 1737, including portraits of his parents, Pierre Le Moyne d'Iberville (the founder of Louisiana), a child of the Le Moyne d'Iberville family, and Madame de Béthune (probably Marie-Thérèse Pollet de La Combe-Pocatière, Le Moyne d'Iberville's widow who married the comte de Béthune and died in France in 1740), in addition to two canvases of the Virgin and Child and a Head of Christ. Notarized in Montréal in 1724, the inventory of goods owned by the fur trader, judge, and seigneur François-Marie Bouat and his wife Madeleine Lambert Dumont included two paintings in gilt frames depicting the Baptism of Christ and the Flight into Egypt. 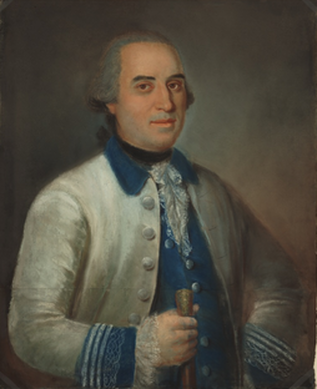 Jean Petit, a Marine treasurer in Québec, owned a portrait of himself in 1732. Philippe Peiré, a bourgeois of Québec living in the rue du Cul-de-Sac, owned a variety of paintings when he died in 1733, including a painting of Christ, "two other small paintings of Our Lord and the Virgin in their giltwood borders," and another depicting the Holy Family. Peiré also owned eight paintings of flower pots set within giltwood frames and two of "figures," the former perhaps comparable to "six paintings of flower pots of different sizes inventoried in the home of Étienne Veron de Grandmesnil of Québec in 1743. Marie-Louise Chauvin, the wife of Nicolas Perthuis of Québec, died in 1737, leaving a painting in a gold frame whose subject was not recorded. The 1746 succession of Marguerite-Louise Douaire, the widow of the bourgeois Nicolas Pineau of Québec, recorded three small framed paintings of "Our Lord and the Virgin" along with a larger canvas depicting the Virgin Mary in a gilt frame, a portrait of her brother-in-law Monsieur Fleury in a gilt frame, and two other paintings. Québec merchant Nicolas-Jacquin Philibert and Marie-Anne Guérin displayed a painting of Saint Peter in their chambre in 1748. Pierre Gaultier de Varennes, seigneur de La Vérendrye, owned a portrait of Louis XV in a gilt frame at his Montréal home in 1749. 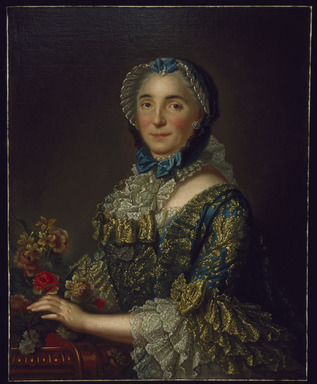 Louise-Geneviève Ruette d'Auteuil, the widow of Jacques-Pierre Daneau de Muy, owned three family pictures in giltwood frames at the time of her death in 1760. Because many members of the Canadian elite departed for France after 1760, it is likely that many works of art present during the colonial era left with them. Further south, the 1743 inventory of Jacques de Blaine du Château's plantation in Guadeloupe records portraits of the king and queen in gilt frames. Upon his death in 1757, Claude Joseph Villars Dubreuil, Contractor of Public Works for the King and militia captain in New Orleans, owned eleven paintings in giltwood frames, twelve small paintings on glass, and two overdoor paintings in giltwood frames. Valued altogether at 18 livres, portraits of Louis XV, Marie Leczinska, the dauphin, and the dauphine were left by Jean Cambon, substitute prosecutor for the royal admiralty in Martinique, upon his death in Saint-Pierre in 1766.